A short post again since I’m doing all 6 shows this evening. Not much time! 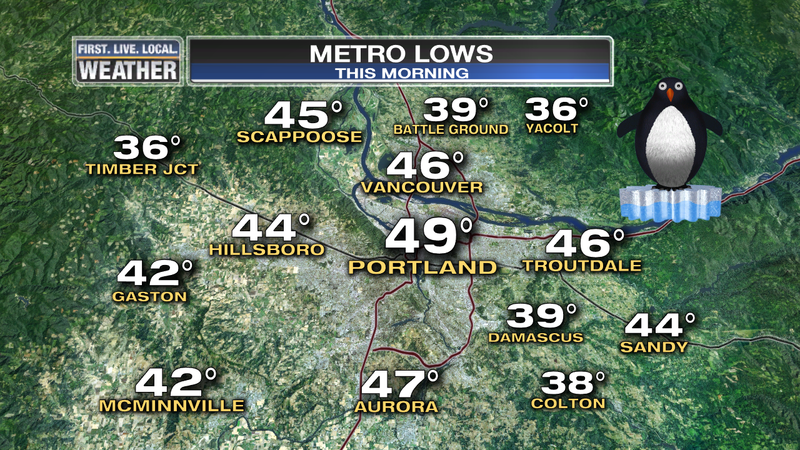 Last night was the coldest we’ve seen so far this early fall in the metro area. All of us saw lows in the 40s, with some of us making it down into the upper 30s. Poor Yacolt, all the way down to 36…brrr! Notice that it’s later at the coastline due to the mild influence of the Pacific Ocean. You don’t get frost very often when you are right beside a 50 degree ocean! For sure not anything the wind is coming from the northwest, west, or southwest. One other spot that has a very late frost is right in the middle of the urban areas. 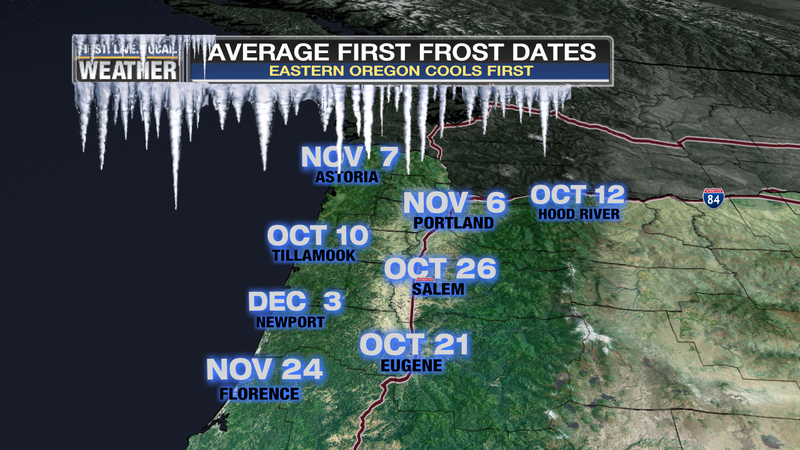 At PDX, although it is surrounded by lots of open land, that station has an average first frost in early November. It’s not on the map, but downtown Portland is even later…in December. Basically in the middle of all that concrete freezing conditions don’t show up often. The KGW downtown COOP site only averages 16 days each winter below freezing! Looking ahead, we are in what I would consider some of the best weather of the year. Cool nights and warm & sunny days. Yet it isn’t hot, but not cold either. Goldilocks time I think. Mainly highs around 80 or so through Saturday and then 60s and 70s beyond that. For the first time in a couple of weeks models are suddenly in huge disagreement over what happens Sunday and beyond. The ECMWF is pushing zonal flow (moist westerly wet pattern) over or much closer to us starting this weekend. The GFS is keeping us dry. Here’s the issue: normally we can look at the respective ensembles from each model and that will give us a good idea which model is performing better. For example if most of the ECMWF ensembles support the GFS solution then you go with that instead of the lone ECMWF operational model. Yet in this case the 12z model ensembles supported their own models…not real helpful! By Friday the 23rd, 28% of ECMWF ensemble members say we will have seen 0.50″ in Portland. 84% of the ECMWF ensembles show rain at some point between Sunday and the following Friday. ECMWF says SOME sort of rain showers are on the way. Only 3 out of 21 GFS ensembles show that 0.50″ or more by Friday the 23rd. GFS says mild and dry weather will continue. So I did a 7 Day forecast based mainly on the ECMWF with a little GFS (not quite as wet and cool Sunday) thrown in. The main point is that showers MAY show up on Sunday. 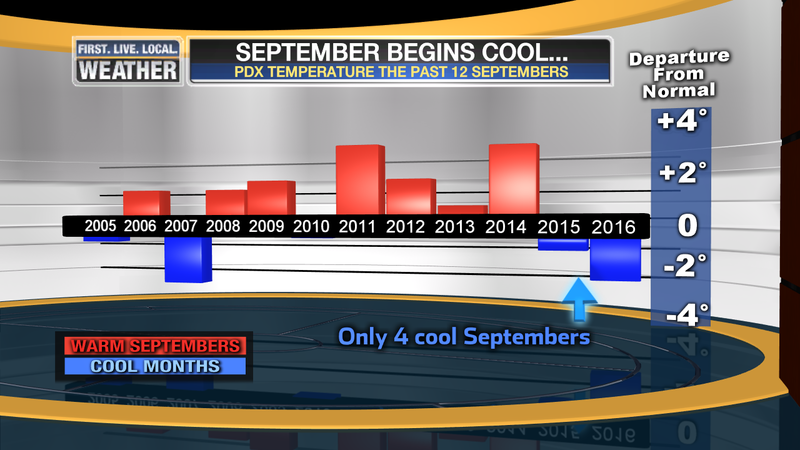 I used this graphic yesterday at 10pm, showing our string of warm Septembers. So far this month we are running well below normal for the first September since 2007. We’ll see how it looks a week from now. We may end up erasing that cold anomaly. How dare we let Portland end up with a COLDER THAN NORMAL month! It seems to take an act of God for that to happen nowadays. But eventually it will happen again, right? This entry was posted on Monday, September 12th, 2016 at 9:08 pm and is filed under Weather. You can follow any responses to this entry through the RSS 2.0 feed. Both comments and pings are currently closed. Mark, is that a typo for Tillamook’s first frost? October 10th seems way early — earlier than Hood River. Should it be November 10th? Actually it isn’t. I checked twice. Tillamook was 40-41 the past two mornings, quite a cold valley under offshore windflow and clear/calm nights. Those lows were similar to Battle Ground. My tomatoes are still green, I’ve had only a handful ripen as of yet. They’re in the same place they’ve always been. Whaaat? No peppers and only a few tomatoes?! We started eating tomatoes in July. Harvested Walla Walla sweets in July. We live on the north side of a hill with houses starting to block several hours of sun but we’ve already roasted and frozen lots of sweet and hot peps. Picked, eaten and frozen many pounds of tomatoes. I did hear the same story from some other folks from the Portland/Vancouver area lately. Just goes to show how micro climates vary by not so many miles apart. Peppers were started from seed at the end of January, potted over Spring Break, and set outside mid-May. Jalapeño = several peppers almost ready to pick, many more growing. Serrano = A few small growing, many flowers. Bell = Lots of flowers, no peepers. C-Tom = A few flowers, no peppers. K(something) = some flowers, one small-ish pepper. Cayenne = nothing, just an empty bush. 6 types of tomatoes, all planted from 4-inch starts in late May. So far only a dozen ripe tomatoes, but tons of green ones. The exception is the Sungold Cherry Tomato plant, which has produced many small ripe fruit, but they’re nowhere near as sweet as they’ve been in years past. Only about half of those blossoms produced fruit, and the majority are still green. Don’t know what to tell you, other than Salem and Albany were considerably warmer than here this last Summer. Uh oh. It’s baaaaaack, according to Cliff Maas. The “Blob”, that is. See his comments in the Oregonian article. Blobs can be easily killed by a series of strong storms that break up the warm surface water and mix it with cold water from deeper in the ocean. Here’s hoping that happens to this one sometime this fall. GFS 0-10 day meteogram has PDX at 2.97 precip. But EUG at only .49. I think both are overblown. Peace. I usually see my first frost sometime in the last week of October, or start of November. I live closer to the ocean, so that makes the difference. 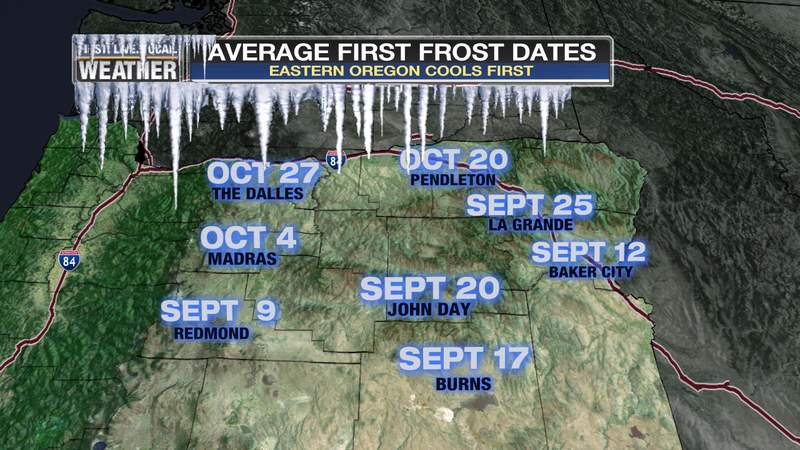 The earliest frost was late September 1972 when we had an arctic outbreak come through then. Mine’s been in November or even December since I’ve moved to my current location, but I know October frost is a possibility for me, just based on the latest frost I’ve observed (late April, the 25th I believe). I’m surrounded by salt water so I’m definitely not in a favored location for early or late frosts. Didn’t get a chance to check the thermometer this morning but I’m reasonably sure the low was in the 40s, just based on how chilly it was this morning. Woke up this morning to a 62 degree house! Coldest since last winter! Time to leave the new heat pump system on overnight. The AC was fabulous to have during the summer but WOW I love the “2-minutes flat” warm up it provided today, going from 62 to 69 when I got up at 6am 😍 Always surprises me how much warmer 7 degrees can feel!! Thanks for the very interesting post Mark. Eagerly awaiting snow watch 16-17! !